Secretariat wins the Black Eyed Susans in 1973. Only the 6th undefeated Derby winner, he has won on dirt, on grass, on fast tracks, on off tracks, you name it. Clearly the best horse based on his great Derby performance, and he ran the last quarter-mile in a blistering :24 1/5 while being hand ridden(he wasn't whipped once by his jockey), but three questions must be answered before he can be anointed as the next super horse. First, he has always raced off longish layoffs. The time between his last 5 races has been 5 weeks, 8 weeks, 5 weeks, 7 weeks, 7 weeks. Can he come back in only 2 weeks and run big again, or will the short time affect him? The trainer's strategy is that Barbaro should be fresh for the grueling test of the Triple Crown: 3 tough races in only 5 weeks. 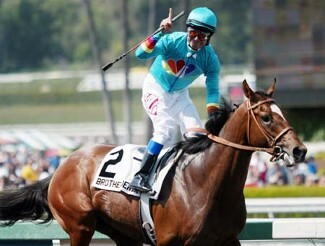 If he does this again, then it's Triple Crown mania time. 2nd choice on the morning line at 3-1. Had about as bad a trip in the Derby as a horse can have. Outside post, 4 wide in the first turn, 9 wide in the far turn, and he threw a shoe during the race. Despite all of that, he rallied late and finished very strong, dead-heating for 4th. He was 16th with a 1/4 mile to go rallied all the way to 4th, running the final quarter-mile in :24 3/5 without one of his shoes. The brave battle and strong finish despite the horrible trip means one of two things: 1) he still may be the best 3 year old out there, and given a trouble free trip that is much more likely in the Preakness, may very well beat Barbaro and win 2) absolutely nothing - bunch of coincidences. The post time Derby favorite also had bad trip and never really got to run "his race". This horse likes to be at or very near the front. He was bumped badly at the start and by the first turn was way back in the pack, which is not where he needs to be. Made a big rally along the backstretch to get to 4th at the top of the stretch, then faded. 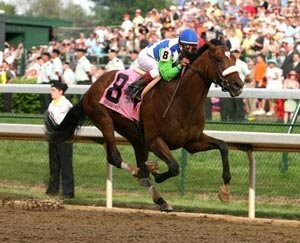 Like Brother Derek, maybe a good trip in the Preakness will allow him to show his true ability, or maybe the bad trip is meaningless and he just isn't as good as Barbaro. We'll find out Saturday. I would be very suprised if the winner did not come from these three, although if one of these next two won then it wouldn't be a total shocker. This horse is very lightly raced, with only 3 career starts, and never having run a race around two turns. 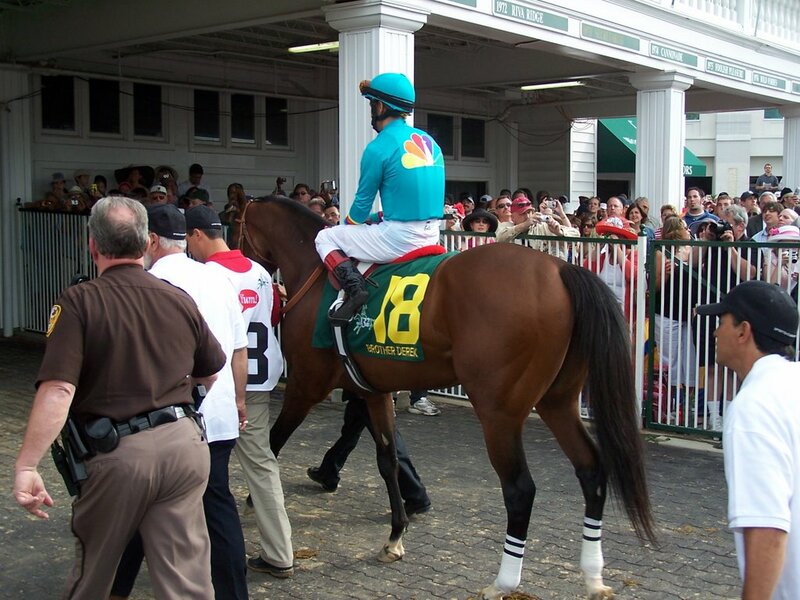 These two factors alone suggest that the Preakness is way too big an ask for him. However, many feel that this horse has so much raw talent that he might just be a freak who can oversome such odds and run away from them all. Many think that with more experience this will be a horse to be reckoned with later in the year. It looks like too much too soon for Bernardini. He may very well run big and hit the board; if he wins then all of the wiseguys will say "I told you so - he is a freak". Likes to come off the pace, and if you make enough excuses for him, he's not a bad value at 20-1. 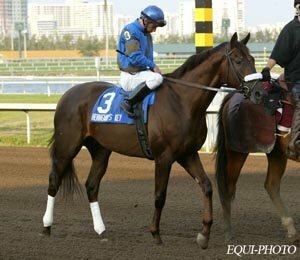 After winning an allowance race impressively at Aqueduct, he ran 4th in the Gotham (1/2 length behind Sweetnorthernsaint) after being stuck on the rail most of the way around. The track was sloppy for the Wood, so his 7th place finish by 26 lengths could very well be a throwout. Likewise for the Lexington, which is a quirky race on a quirky racing surface that horses tend to either love or hate. If the Lexington surface just wasn't for him, the sloppy track in the Wood wasn't for him, then he very well might be able to hit the board or even win. Again, not a bad value at 20-1, although at the same time you are playing a double-hunch. Won the Grade III Gotham over Keyed Entry and Sweetnorthernsaint, then finished 2nd by a length in the Lexington Stakes. He is the speed in the race and will try to go to the front, get loose on the lead, and then run away with it. I don't think that he can do this against 3 top quality stalkers like Barbaro, Brother Derek, and Sweetnorthernsaint. Not a bad choice to hit the board if he can get into a stretch duel. Trained by loved Nick Zito and owned by hated everywhere (but New York) Yankees owner George Steinbrenner, this horse won his first two races and then has been very disappointing in his last four. Nick Zito said Wednesday that if he didn't run a big race tomorrow that he would probably be gelded to settle him down. Zito: "Let's put it this way. If he doesn't show something Saturday, then he might have to be gelded. Maybe he'd be better off. That's the last thing I want to do because I know he's got much more ability than he's showing.'' Wow. No pressure dude, but if you don't run huge tomorrow they are going to chop your balls off. If he knew this going in then there is no way that he wouldn't win, while also setting race, track, and world records for a mile and 3/16. If only he understood English I would simply put $1,000 on him to win, and win big I would. Running for his balls. Literally. Wish him luck. Won an allowance race last time out and before that finished 2nd while 3 wide in the Spectacular Bid while posting a respectable 101 Beyer, but appears to be out of his league here. David Feherty will obviously have a bet on him, since he loves to say "Well, Jim, Vijay's ball is setting weeh dewn in the rough - the lie is just dieahbolical..."
Out of his league. Although at those odds, why not throw a $5 show bet on him just in case? So what's going to happen, genius? First off, I am no genius. Now then, I thought going into the Derby that Brother Derek was the best horse. He was my Derby pick, and given all that he went through he might very well still be the best horse. Anyhow, there is no reason to get off "my" horse, so I am going with scenario 1 of 2 with him laid out above. He either gets in a classic battle with Barbaro, or Barbaro bounces off the big effort and 2 week turnaround, and Bro D fights it out with Sweetnorthernsaint, Bernardini, or perhaps even holds off a late Greeley's Legacy charge. He was my horse a fortnight ago. I'm sticking with him. Not much value with any of the three favorites, so maybe an exacta wheel with Brother Derek on top and the field underneath, or a partial trifecta wheel with Brother Derek and Barbaro on top, those two plus Sweetnorthernsaint in the middle, and ALL on the bottom. Should I drive down to Bay Meadows tomorrow to place such wagers? Last year I was so certain that Afleet Alex was going to win that I wanted to drive down there and place $100 on his nose. I didn't, and of course we won easily. I feel like Murphy's Law will get me this year: if I go down there and place bets that they will lose, and if I stay home and watch in the comfort of my living room then I will of course hit the trifecta and curse myself for a good long while. Who do you like, and why? Enjoy the race. Recap on Monday.